....In fact he's a lot of chewable fun. This bird toy was designed with feather pluckers in mind. Since most feather pluckers like to pluck and chew on the sheaths of their feathers, these plastic straws mimic the feel of the sheath of a feather. I made a similar toy for my feather plucking Umbrella Cockatoo Marshmellow. This parrot toy really helped her which is why I created a smaller version for African Grey and Amazon size birds. 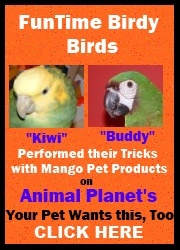 My Amazon "Kiwi" is pictured here although he is not a feather plucker he just loves to have fun chewing on the straws and wood. Bird toy measures 13" long and 8" wide.